Holy Trinity was built in 1837-39 for the new resort of Southbourne by D Burton (B 41 p780) as a chapelry of St Mary. Though the tower has been rebuilt, it differs little from his design; otherwise, the main survival of Burton’s church is the nave roof, with curved braces, traceried spandrels and long wallposts and even this has been extended. The nave had tall lancets with, probably, a shallow east recess for the altar. The original plan apparently had no galleries. By 1852 it was too small and an application to build galleries was made to the ICBS. This was quite contrary to the views of the ecclesiologists, who were strongly represented in the ICBS. 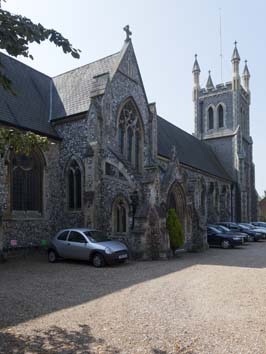 S S Teulon was mooted as architect, but after a dispute with the vicar of St Mary’s and storm damage, it was decided to add aisles instead. A further application to the ICBS failed, as there were insufficient free seats, another of its major concerns. However, money was raised in 1853 for a south aisle, designed by B Ferrey. 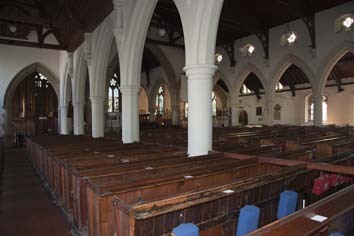 In 1854 a similar north aisle was added. Above Ferrey’s conventional four-bay arcades are cusped clerestory openings and his aisles, of which only the south one remains, had lean-to roofs. The design by Ferrey submitted to the ICBS shows paired lancets like the east wall, so the Decorated tracery is an afterthought, whether then or later. The church still lacked a chancel, which was added in 1861, though a faculty was only granted retrospectively in 1884 (WSRO Ep/II/27/124). It has Decorated tracery, gabled chapels and two-bay arcades like Ferrey’s in the nave. W Burges was the architect (Crook p429), but there is little remarkable about it. A small transept-like projection to the north with a traceried window looks part of the 1861 work, though Brown suggests it might have been added in 1884, which, significantly, was the date of the retrospective faculty for the 1861 work. After 1861 the church met Victorian expectations, except Burton’s tower. However, by 1908 it was again too small and A R G Fenning extended the nave and rebuilt the north aisle in 1909-10 (B 95 p439). The extensions of the nave arcades and roof were unchanged in design and he rebuilt the tower two bays further west and further north. Here too, Fenning followed what he found and the only change from Burton’s tower, by comparison with a print of 1863 (Elleray pl 84), is the replacement of three equal west lancets by a window with Y-tracery; the knobbly flintwork, double lancet bell-openings, heavy pinnacles and battlements remain. The design of the nave west front is new, with a five-light window and flying buttresses above a narthex. Fenning’s aisle is broader than before with varied Decorated windows; if the tracery in Ferrey’s lancets in the south aisle was inserted later, this is the most likely time. The only significant damage in World War II was the destruction of most of the glass (Brown). Communion rails and iron screens: (North west chapel) Said to have been placed here c1971 from the demolished church of St Peter Meads. Font: Octagonal bowl with carved foliage on the sides, standing on short shafts of different coloured marbles. 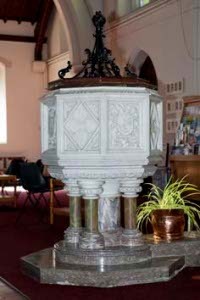 It dates from 1911, as probably does the open wooden font-cover. 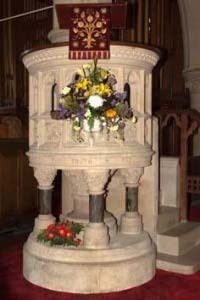 Pulpit: Stone with open sides. It dates from 1872, but is close in spirit to much of Burges’s work, whether or not he had a hand in it. 1. (East window) Heaton, Butler and Bayne, 1934 (www.stainedglassrecords.org taken 11/2/2013). A striking composition, running across all four lights, with the figure of Christ considerably taller than the others. 2. 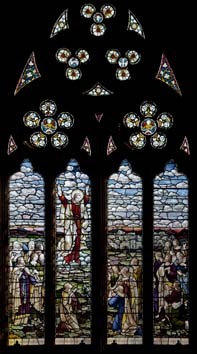 (South chapel, east and side windows) Barton, Kinder and Alderson, 1949 (one signed). 3. (North aisle, east window) Maile Studios, c1949 (WSRO Fac 544), designed by A S Walker (BE(E) p336). Reredos: (North west chapel) by R Thompson of Kilburn and, in addition to his signature carved mice, has other animals and foliage. 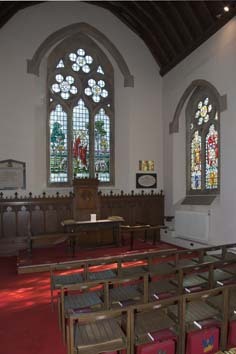 Royal Arms: (North aisle) probably dating from the original building.